Measuring liquid level in a tank or vessel can be accomplished in a number of ways, all of which require some arrangement of instrumentation to either infer the liquid level from the measurement of a related physical property, or directly deliver the liquid level visually using a scaled gauge arrangement. One indirect method of level measurement is often referred to as the bubbler method, so named because it employs a purging gas that continually vents from the bottom of a tube extending into a tank of liquid. Through a simple apparatus, the level of a liquid can be inferred by the amount a back pressure exerted upon the gas flowing through the tube. Probably the greatest advantage of this method of liquid level measurement is that the liquid does not contact the sensing instrumentation. The only portion of the apparatus in contact with the liquid is a tube immersed into the tank. Basically, a purge gas flows through the immersion tube and may bubble out the immersed end of the tube, which is open to allow the contained liquid to exert a hydrostatic pressure on the purge gas. The back pressure on the gas that is exerted by the liquid contained within the tank will vary directly with the depth of the liquid. The back pressure can be correlated to a liquid level. 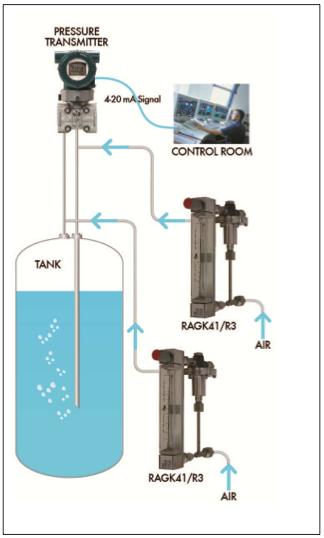 The accuracy of the measurement is related to the proper regulation of the purge gas (explained in the application note below) and the measurement capability of the pressure transmitter. Once the depth of the liquid is derived, further calculations, employing tank shape, dimensions, and the liquid density can provide an indication of the volume and mass of the liquid. Here is an illustration of the setup, provided courtesy of Yokogawa, a recognized leader in flow and pressure measurement with a global presence. Included below, an application note from Yokogawa on applying rotameters to the setup, as well as data sheets for the instruments employed in the illustrated apparatus. Share your level measurement challenges of all types with the application specialists at Classic Controls. Combining your process expertise with their product application knowledge will yield the best process measurement and control solutions. Bubbler Method Liquid Level Measurement from Classic Controls, Inc. Differential Pressure Transmitter From Yokogawa from Classic Controls, Inc.
Rotameter Variable Area Flowmeters from Classic Controls, Inc.